Imbolc is a festival of fire and light, and in many Neopagan traditions, celebrates the goddess Brigid. It falls around the midpoint between the winter solstice and the spring equinox, and marks the successful passing of winter and the beginning of the agricultural spring. The light continues to grow stronger following the winter solstice, and the days grow warmer. The term ‘Imbolc’ (also spelled ‘Imbolg’) is thought to come from ‘oimelc’, which means ”ewe’s milk” or “in the belly”, which signifies the time of year when ewes are pregnant and nursing. 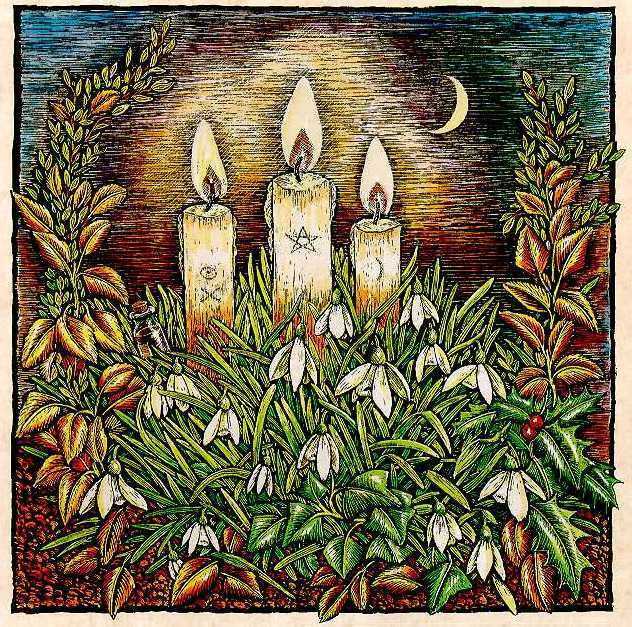 Imbolc is usually celebrated the evening of February 2, however, if celebrated at the exact midpoint between the winter solstice and spring equinox, would fall around February 6th or 7th. This festival is also known as ‘Brigid’, after the Celtic goddess of the hearth, the forge and inspiration. The Irish people took up Brigid as one of their patron saints during the conversion of Ireland from paganism, and therefore Imbolc corresponds to the current festival of St. Brigid. In Gaelic-speaking countries, Imbolc (or Brigid) is known also known as Lá Fhéile Bríde (Irish), Là Fhèill Brìghde (Scottish Gaelic), or Laa’l Breeshey (Manx Gaelic). Imbolc is associated with the Feast of the Purification, or Candlemas, another Christian festival which shares a common date and symbolism with Imbolc. It also corresponds with Groundhog Day, a modern weather prediction ritual which signifies the triumph of spring over winter. 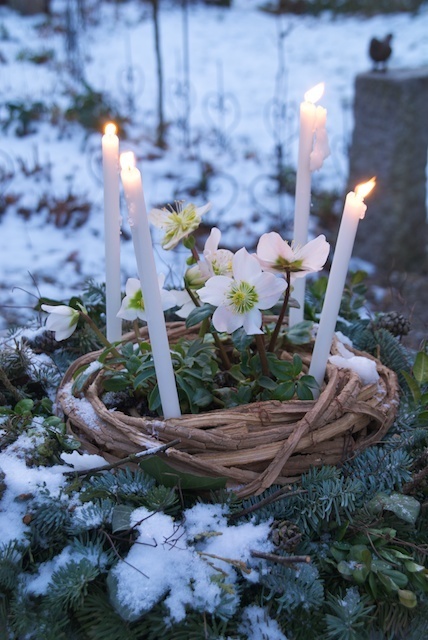 Imbolc is seen as a festival of purification, light, fertility, and new beginnings. It is associated with Brigid in her Maiden aspect, and seen as a time of growth and renewal. In Wicca, Imbolc celebrates the revival of the goddess following the birth of the Sun God at Yule. The replenished goddess is young and vibrant once again, entering her Maiden phase. The Sun Child becomes the Bright Youth, and grows stronger as the earth shakes off the hold of winter. Imbolc is a popular time to hold initiation rituals, through its association with purification and new beginnings. 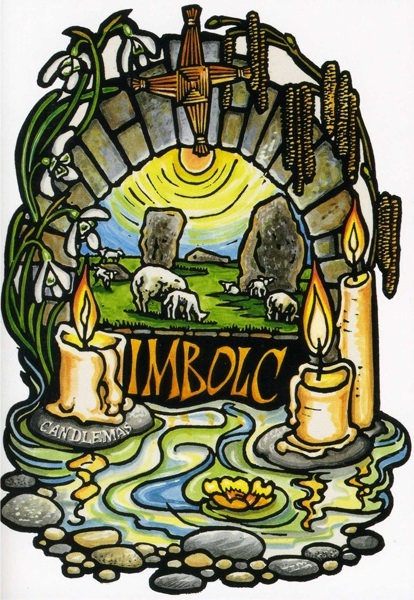 Symbols of Imbolc include corn and wheat, sun wheels, or decorated ploughs to celebrate the beginning of the agricultural year. Traditionally, corn or grain dollies, representing Brigid, were fashioned from stalks of grain and sometimes placed in a bed or basket with white flower bedding. 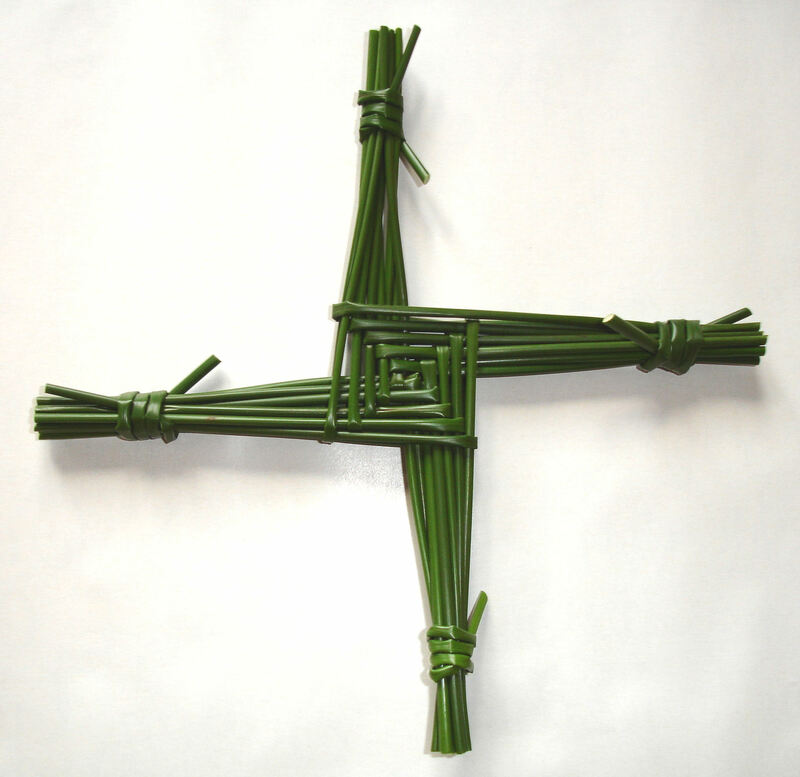 Brigid’s Crosses were made from wheat stalks or rushes, and hung in the house or exchanged as symbols of protection and prosperity in the coming year. Fire was a very important aspect of Imbolc, as purification, protection, and celebration of the returning sun. Traditionally, hearth fires were put out and re-lit, and lit candles were placed in each room to honour the return of the sun. Brooms, or besoms, were placed by the front door to symbolize sweeping out the old and welcoming the new (an early form of ‘spring cleaning’). Imbolc is a good time to get your life in order, physically, mentally, spiritually, and emotionally. It is a good time to make new plans, organize, clean out drawers and closets to bring in the new and clear out the old.